Pawparazzi Pets provide hours of fantasy playtime for young girls. Each set contains either a kitten or puppy of your choice with stylish carrying purse, collar, leash and more. Two styles available – each style has four different pets to choose from – Indy or Daisy for dog lovers; Toby or Misty for cat lovers. Pawparazzi Pets sent me the Indy Pawparazzi Set ($20), Pink Pet Bed ($4.50) and the Flower Fairy ($13) clothing and accessories set. The Indy Pawparazzi Set includes a plush dog, stylish pet carrier, leash, collar, pop-out trading card, blanket and Celebrity Magazine. The Flower Fairy set includes Fairy Dress, Flower Headband and Dragonfly Purse. My cousin was the proud recipient Pawparazzi Pets collection, and she loves everything! 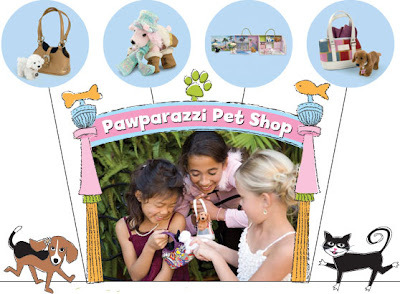 I can see why any little girl would adore the Pawparazzi Pets collection. Everything is so beautifully detailed. Also, anything that involves dress-up is a winner!